2000 AD has a myriad of different worlds to draw from, with stories which stretch from the beginning of the comic to the present. There follows a list of some of the more popular that can be used in games, many of which we will release as future game settings. It is the year 2099. After a series of disastrous global wars, much of the planet has been reduced to a radioactive wasteland, vast stretches of which are uninhabitable, both from the radiation and the mutated horrors that make their home in the Cursed Earth. Civilization now huddles in vast mega-cities, conurbations encompassing massive stretches of land. The most important mega-city, and the primary setting for the Judge Dredd stories, is Mega-City One. Mega-City One’s size and sprawl makes enforcing law and order difficult, and so the city employs special law enforcement agents called Judges to patrol the city and police its streets. No simple cops, Judges have complete power to enforce the law by any means they deem necessary, sentencing and convicting any criminals they catch, even executing them when necessary. Easily recognized by their distinctive helmets and uniforms, Judges cut distinctive figures in Mega-City One, evoking fear, favor, and hatred in equal measure from the people they would protect. 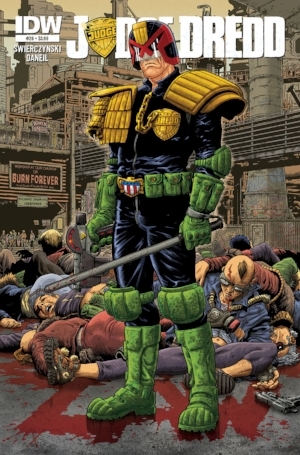 Of all the Judges enforcing the law in Mega-City One, the most feared and respected is Judge Dredd. A dour, humorless man, utterly committed to punishing lawbreakers and keeping the peace, he has squared off against some of the most notorious criminals to have terrorized his city. While he always gets his man, Dredd is but one man and with the constant unrest and upheaval making the city a dangerous place, there’s always a need for fresh recruits to join the fight. It’s time for you and your friends to earn your badges, take up your Lawgivers, and bring justice to the city. You might die, as many have before you, but you might also make a name for yourself, one worthy to place alongside Dredd’s. The ABC (Atomic. Biological. Chemical.) warriors are war machines, with the robots forming a small elite force at the end of the Volgan War as they are recruited to tame the new world of Mars. These robots must face a Mars which has become a lawless, futuristic Wild West. Often at odds with their human commanders, the A.B.C. Warriors do the missions that humans are too ill-equipped (or too apathetic) to do. In ABC Warriors you will be on the front line fighting against Volgs, or taking part in the campaign to make Mars safe for the new human colonists. Players can play as robots or even as human soldiers working alongside their mechanised counterparts. 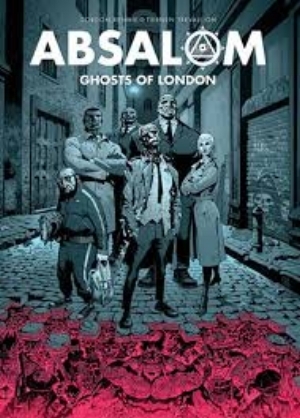 Twenty-first century London is patrolled by the likes of Harry Absalom and his colleagues, part of a team who police the terms of the Accord. The Accord is a treaty drawn up between the British Crown and Hell, so Absalom is kept busy… The world of Absalom is a spin-off from Cabalistics, Inc, the setting in which Harry first appeared. It is a dark setting, with the forces of the supernatural arrayed against the special team charged with keeping the terms of the Accord intact. There are magical powers, possession, supernatural forces, demons, and rogue entities of all kinds present for the Crown’s special police to deal with. Player Characters can join Harry’s team or head up a section of their own, and they will face the denizens of Hell who would like nothing better than to shatter the Accord and bring chaos to Earth. They will also face down rogue factions from all quarters, incredible supernatural enemies, and sanity blasting Old Gods. Absalom’s world is not one for the faint hearted. Ace Garp, GBH the Biffo, and Feek the Freek are the crew of the Speedo Ghost, a futuristic cargo spaceship, with Ghost itself being a sarcastic AI. Ace is always looking out for ways to make his fortune, coming up against hostile aliens, pirates, police, other truckers, and even a hostile planet. Trucking Company fights hard to get the best contracts, dodging the law, other truckers, and trouble at every opportunity. With the likes of Jago Kain, a rival human captain, and the vicious space pirate Cap’n Evil Blood who would like nothing more than to end Ace’s life, the stories of space trade, humour, and misadventure is just the tip of the spaceberg. In Ace Trucking Co, you will be able to run your own shipping company, or work as ACE Trucking. Prepare for backstabbing space-trucking adventures as characters can draw from a rich and diverse set of alien races, as well as career archetypes. This setting features Department Q, originally created in 1940 to combat the rise in occult warfare by the Nazis. The department has a long history of excellent performance. The Department Q of the past is not the present, however, and in 2004 the British Government privatised it; now the crusty paranormal historian, Doctor Jonathan Brand and his assistant Jennifer Simmons face the future in the private sector. The Department has been brought up by the showy pop star Ethan Kostabi, a man with multi-millions in his bank account. Kostabi has transformed the Department into Caballistics, Inc. This new team includes new recruits Hannah Chapter and Lawrence Verse, who head up the organisation. Their game plan to respond to all kinds of major paranormal threats. This setting is extremely dark; Player Characters will face death, insanity and worse on a regular day-to-day basis and may not be able to trust their own allies. Player Characters can be new recruits to Caballistics, Inc and will face threats that slowly ramp up until their very souls are in peril. Join Titus Defoe in the 17th Century, a man who once fought for the Roundheads and saw action at the Battle of Naseby. After the Civil War he and his comrades were betrayed by Cromwell, many were killed or exiled. Titus became disgusted with Cromwell’s actions and left military life, going on to work carrying a sedan chair around London. In 1666 a massive comet passed over the southeast of the country; this started the Great Fire of London and brought the dead to life from the ashes. Titus’s wife and children were among those who lost their lives and he joined the employ of the recently returned King and became a zombie hunter. Now you can join the battle against the hordes of the dead and those who control them; protecting all that is dear to you from the relentless undead in this alternative version of seventeenth century Britain. In Defoe the Player Characters can join the ranks of the King’s zombie hunters, battling the undead in the streets of London. They can be new recruits to the cause, or seasoned veterans who have fought alongside the likes of Titus in the past against terrible odds. With the aid of weapons the like of which may never be seen again, designed by Sir Isaac Newton and Robert Hooke, they can fight against the reeking tide. Space is vast, mind-boggling and awesome in every sense. It is full of majestic creatures, intelligent aliens, incredible feats of engineering and a pair of delinquent alien drop-outs with access to incredible amounts of firepower. The Universe of D.R. & Quinch gives you the opportunity to attend the most prestigious of alien establishments, meet hot aliens and ignore every single scrap of homework in favour of grabbing a lot of guns, a big dose of attitude, a stolen time travel machine in order to wreak havoc on Earth’s timeline. D.R. (Diminished Responsibility) Waldo Dobbs and Ernest Errol Quinch are waiting for you to join them. Players could find themselves cleaning up after D.R. & Quinch, or bunking off to join them on their adventures. Run scout camps, start wars, make movies, open care homes. Whatever you decide to do can lead to the wildest of adventure as long as it ends with several impressive explosions. In the future the teeming hordes of humanity are unable to get all the nourishment they need from their own world so they seek to fill their plates from the past. The vast herds of dinosaurs from the distant past are just waiting for the men from the future to round them up and get them shipped out to the hungry mouths that await them. Fire up the grinders, get the sluices cleaned and prep the time machine for the ride of your life. In Flesh you’re going to be responsible for tracking down and herding the massive herds from the past, bringing them into vast factory complexes where the best cuts of triceratops can be processed and shipped to the future for an immense profit. Life on this new (old?) frontier is harsh, and the work dangerous. There are lawless townships that provide recreation for the new breed of cattlemen, and the dangers from the great meat eaters and hostile environment are considerable. To make matters worse the companies that work the plains are beyond the control of government and safety is never an issue - although the financial rewards are high will you get to spend it? If you have the Rembrant Index, a gene that occurs in one in twelve million people across the multiverse, death is not necessarily the end for you. Welcome to Indigo Prime, an extra-dimensional agency dedicated to the maintenance and repair of distortions, breaks and anomalies that exist across the many alternate realities. You will be given a new body and trained to be one of the agency’s finest. Agents include Sceneshifters (manipulators of the physical world), Seamsters (who deal with time) and Imagineers (who can influence minds and dreams). Player characters start out as dead, transferred into a new body and trained to accomplish things far greater than they could in life. Armed with your new powers, you are going to be tasked with repairing any rips or tears in time and space you might find. You will also investigate and deal with any anomalies that crop up. In need of an agent with superior physical and mental abilities the British authorities chose John Probe to be MACH-1 - Man Activated by Compu-Puncture Hyperpower. This process, an advanced form of acupuncture, improved his physical abilities to far beyond those that could be reached naturally. With an advanced computer implanted in his skull, his body could be fine tuned to accomplish feats beyond the normal human limits. The computer also processed tactical information to allow MACH-1 to accurately calculate the correct angle for a shot, or the right amount of force to smash someone’s sternum. Join MACH-1 and the fight against the enemies of freedom and unleash your potential. Do you have what it takes to become activated by Compu-Puncture Hyperpower? Player characters in M.A.CH. 1 are going to be agents enhanced by Compu-puncture Hyperpower. Fighting against terrorists and the Soviets in some of the most hostile locations possible they will be a strike force without equal. In 1926, while practising a new illusion, Harry Houdini has a near-death experience and awakens the Sleepers. Meanwhile the author H.P. Lovecraft is visited by a talking raven and Sir Arthur Conan Doyle attends a séance that is disrupted by a mystical force that possesses the medium. The three join forces with paranormal investigator Charles Fort in New York, where they are attacked by entities known as Tcho-Tchos and embark on a dangerous journey. Player characters in Necronauts will join the likes of Harry Houdini and company to battle the Sleepers, and the Illuminated ones. Set in the early part of the 20th Century the Necronauts fight against cosmic horror and are drawn from all walks of life. Your agents will be no different, but they will be possessed of a singular spark that marks them as a cut above the rest. Welcome to Termight, Earth in the far distant future. Aliens are everywhere, and the leader of Termight despises all alien life. Enter Nemesis the Warlock, master of Khaos and freedom fighter for alien rights. Join Nemesis and his struggle, fight with the likes of Purity Brown against the evil of Torquemada, the Grand Master of Termight, and foil his diabolical plan to eradicate all alien life in the universe. Player characters can play human sympathisers, resistance agents, citizens of Termight and more as they join Nemesis in his battles against the Grand Master. Players can play an alien like Nemesis, the arch-deviant, and tear through the terror tubes in their own Blitzspear, wielding the power of Khaos. Expect battles galore against the tyrannical forces of the human empire and plenty of non-stop action as the war rages. It is the 27th Century and a resurgent Imperialist Russia has seized control of Earth and known space. Enter Nikolai Dante, illegitimate scion of the Romanov Dynasty — rivals to the Tsar. 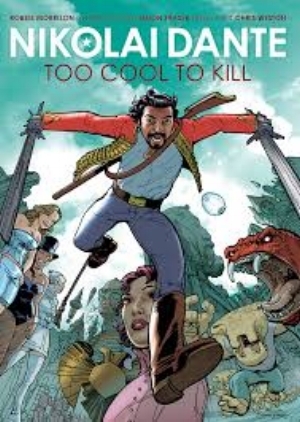 Dante is a swashbuckling young thief, a ladies’ man, and bonded to an alien cybernetic device. Dante’s life is one of action, adventure, politics and danger where friends are in short supply and enemies lurk around every corner. Fortunately Dante can hack into computer systems, extrude bio-blades from his hands and fight back with every weapon at his disposal against the evil and corruption prevalent among the noble families who rule Earth. Player characters can join be agents of one of the many factions within the Empire. Perhaps they will fight alongside the Tsar against his enemies or for the Romanovs, who are, as a rule, every bit as wicked as the ruling family. Or they may be caught between them, trying to survive against the overwhelming power of the two major factions. In the future when robots do everything for man there is little need to work. However robots mimic humanity too well and there are always those that turn bad. Here robo hunters come into their own. From tracking down lost and stolen robots to wiping out gangs of rogue machines that have turned to crime there is plenty to keep these intrepid humans occupied. You will learn the tricks of the robo hunters and face off against various robot enemies. These will vary from rogue robot colonies that refuse to recognise the supremacy of mankind, Robo Hunter will take you to Earth and beyond as you try to make ends meet, since the life of a robo hunter is, more often than not, far from lucrative. Player characters can take on the role of robots in Robo Hunter, helping, or perhaps hindering the robo hunters in their job. Or they can join the robo hunters and help bring some of the most villainous robots to justice in a world dominated by machines. For the Rogue Trooper life is a continuous war, a war against the vicious Norts and their ruinous war-machine. Become a G.I. (Genetic Infantryman), a soldier bred to survive on the poisonous battlefields of Nu Earth, which chemical weapons have turned into a hellhole, barely habitable by man. You are faster, stronger and more resilient than those you face in battle. Even when you die it is not the end, your personality is encoded on a chip implanted in your skull. If removed shortly after death you can be inserted into a G.I.’s specialised equipment for later insertion into a new cloned body — inserted you are able to control the equipment and use its functions independently. Toss mines as the Bagman, get tactical information as Helm, or shoot Norts from beyond death as Gunnar. In Rogue Trooper Player Characters can be G.I.s or Southers joining the fight against the Norts. Expect epic war action, battles against overwhelming odds and a gruelling fight against a relentless and clever foe. Player Characters can engage in a variety of missions from out and out assault to stealth based infiltration. Alternatively players may be among those trying to eke out an existence among the devastation created by the two rival powers on multiple worlds. Download. A vast central European city where crime lords employ gun sharks, hitmen (and women) who eliminate their rivals. Finnigan "Finny" Sinister and Ramone "Ray" Dexter are the premier gun sharks in the city; you will be fellow assassins, employed by the gangs to ensure they keep their grip on the criminal underworld. In addition to taking jobs to eliminate criminal rivals Player Characters might act as bodyguards, help break out criminal figures from prison or even act as guides for alien visitors. With a wide variety of potential targets the fact-totem, the gun sharks’ information network, will continually provide work for those eager to take up the contracts. In the distant past join Slaine MacRoth, his companion, the dwarf Ukko, and unleash the powers of the Warp Spasm to help save the tribes of the Earth Goddess. The malevolent Lord Weird Slough Feg and his minions seek to sink Tir Na Nog and its people beneath the waves in a cataclysmic flood. Become a hero of the Earth Goddess and venture forth, axe in hand to battle men and monsters, most notably the demonic Formorians and their gods. Player Characters can be fierce warriors, druids of the Earth Mother, and more as they join Slaine in his fight against the evil drunelords and Fomor. Steeped in Celtic myth the world of Slaine is rife for barbarian fantasy adventures and archetypes of all kinds. In 2150 a nuclear war wiped out seventy percent of Britain’s population. The resulting radioactive fallout caused mutations, and the number of mutants increased almost exponentially. Life became desperate as the norms became more and more prejudiced against the mutants until the rise of Nelson Bunker Kreelman, whose solution was to eliminate the mutants once and for all by starvation, disease and out-and-out murder. The mutants rebelled and the bloody conflict left the mutants saved but living in an apartheid system with the rebels banished from Earth. 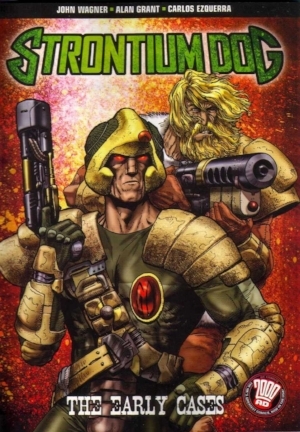 In 2180 the only job left to them is that of a Strontium Dog, a bounty hunter, an agent hunting down the worst of the worst criminals for those who consider bounty hunting to be too dirty a task for them. Join Johnny Alpha and the SD Agents on the Doghouse and face humans, mutants, aliens and robots – the scum of a hundred worlds. Player Characters in Strontium Dog are usually mutants, it is almost unheard of for a ‘norm’ to join their ranks. The only requirement is that your characters are ready to bring in the bad guys. Welcome to the 50th Century, to a world very different to our own. Halo Jones is an everywoman who just wants to live her own life, and spends most of her time in a giant ring-shaped floating conurbation known as the Hoop, located just off the east coast of America. The stories in the series see her leave the Hoop after a particularly traumatic day, working as a stewardess on a luxury liner. Later she joins the army, fighting on two of the worlds where conflict is brutal. In this setting you will play ordinary people living ordinary lives, but becoming embroiled in the greater events occurring around them. They could live their lives upon the Hoop, trying to survive as increased-leisure citizens or they could flee Earth and find themselves in the middle of one of the wars raging in the worlds beyond our solar system. It is the Golden Age of Piracy and things have never been better. Or worse. Magic and supernatural forces are at work; zombies, ghost pirates and werewolves stalk the seas. This is the world of Captain Jack Dancer, one-time captain of the pirate ship known as the Red Wench. Jack is a man who once served the Royal Navy with honour and distinction, then one fateful day he rebelled with his crew against a tyrannical captain — Jack is now on the run from British justice as a pirate and having a whale of a time. Red Seas mixes Golden Age piracy with magic, legendary figures such as Aladdin and more. Player Characters in the Red Seas can be members of Jack’s crew, have their own ship and captain or they can even be masters their own vessel, seeking out the wonders of this setting where magic, legends, myth and stories collide. The V.C.s (Vacuum Cleaners) are star troopers battling against a terrible alien enemy known as the Geeks. More likely to come from one of the space colonies rather than Earth herself the V.C.s are humanity’s hope of staving off annihilation at the hands of its implacable foes. In the V.C.s the Player Characters are members of an elite squad, completing missions beyond the capabilities of most other star troopers. Earth’s High Command will send you on increasingly dangerous missions against the invaders, the cost may be high, and you will be the ones who have to pay it should things not go to plan. You will engage in a variety of missions off planet and take the fight to the Geeks. In addition to the ones mentioned here, there’s a whole host of other 2000AD Worlds that we’ve got in the wings. This is the complete list of the Worlds of 2000AD. Judge Dredd (Including All Dredd-world strips, Judge Anderson, The Dark Judges, Chopper, Mean Angel, Missionary Man, Lenny Zero, Shimura, Cursed Earth Koburn, The Simping Detective, Low Life, DeMarco and so on), ABC Warriors, Rogue Trooper (inc. Venus Bluegenes), Strontium Dog (Including Durham Red), A.B.C. Warriors, Ro-Busters, Sláine, Sinister Dexter, Nemesis the Warlock (Including Torquemada, Purity Brown, and others), Nikolai Dante, Invasion (Including Savage), The V.C. 's, Tharg the Mighty, Banzai Battalion, Mercy Heights, Tor Cyan, The 86ers, Blackhawk, Black Siddha, The Visible Man, Defoe, Flesh, A Love Like Blood, A.H.A.B., Abelard Snazz, Absalom, Ace Trucking Co., Age of the Wolf, American Gothic, Ampney Crucis Investigates, Angel, Angel Zero, Ant Wars, Armoured Gideon, Asylum, Atavar, Babe Race 2000, Bad City Blue, Bad Company, Caballistics Inc., Canon Fodder, Chiaroscuro, Colony Earth, Cradlegrave, D.R. & Quinch, Damnation Station, Dandridge, Darkness Visible, Dash Decent, Dead Eyes, Dead Meat, Dead Men Walking, Dead Signal, Death Planet, Detonator X, Downlode Tales, Dry Run, Family, Fervent and Lobe, Fiends of The Eastern Front, Firekind, Freaks, From Grace, Glimmer Rats, Go Machine, Halo Jones, Hap Hazzard, Harlem Heroes, Harry Kipling (Deceased), Harry Twenty, Hewligan's Haircut, Ichabod Azrael, Indigo Prime, Interceptor, Kingdom, Leviathan, Lobster Random, London Falling, M.A.C.H.1 (Including M.A.C.H.0), Maniac 5, Mean Team, Meltdown Man, Mother Earth, Necronauts, Night Zero, Outlaw, Project Overkill, Rain Dogs, Revere, Robo Hunter, (Including Samantha Slade), Sancho Panzer, Second City Blues, Shadows, Shakara, Shako, Silo, Skizz, Slaughter Bowl, Snow/Tiger, Sooner or Later, Soul Gun Warrior, Stickleback, Stone Island, Storming Heaven, Synnamon, The Bendatti Vendetta, The Mean Arena, The Red Seas, The Ten-Seconders, Trash, Tyranny Rex, Ulysses Sweet, Universal Soldier, Valkyries, Vanguard, Wardog, Witchworld, XTNCT, and Zombo.